Is it Practical to be Animal Free? Home > Animal Free Basics > Is it Practical to be Animal Free? An animal free lifestyle is one where we try to minimise the ways in which we consume animal products. That means not eating animal derived foods not buying clothes and accessories made from animals and not using products containing animal products or that have been tested on animals. In practice it is probably impossible to be 100% animal free. Many products that contain animal derivatives hide their ingredients behind complicated chemical names and others do not declare their ingredients. Some products claim not to have been tested on animals, when some of their constituent parts have been tested. Other products it is impossible to own without them including animal products. And almost all medicines have been tested on animals or may contain some animal based derivative. Since it is essential for many of us to take medicines to maintain our health, it will be unfeasible to eliminate all animal products from our lives. However, even small steps to removing animal products can make a big difference. Consumer power should not be under estimated and making a conscious effort to avoid animal based goods will save animals. Many people may be put off from making the change to an animal free lifestyle thinking it is too hard to do, or because they don’t know where to start. In fact today it is easier than ever to avoid animal products with just a little knowledge of the subject. New laws about the transparency of ingredients in our food, our clothes, our toiletries and our cleaning products mean it is much easier to identify those that contain or have been tested on animals. The first and perhaps easiest step to make is changing your diet to vegetarian or vegan. It is easier that ever before to achieve this because ingredients are usually accurately labelled, and many foods are marked as suitable for vegetarians or are recognised by the Vegetarian Society. Vegetarian options are widely available in supermarkets and most restaurants provide vegetarian dishes. Even if cooking is not your forte, it is still easy to buy many different kinds of vegetarian and vegan foods and ready meals. With clothing and accessories it can be even easier to avoid animal products because it is really only wool, fur and leather you need to steer clear of. 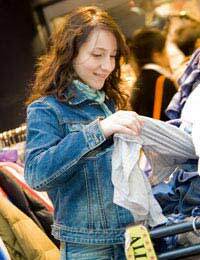 Most clothes are clearly labelled with their contents and will specify if they are cotton or man made. Wool can be trickier to identify because there are several different varieties, but just a little knowledge will help you spot them. It is a little harder to avoid cosmetics and toiletries that are animal free, not least because animal testing has been going on for decades and virtually all cosmetic ingredients have been tested on animals at some point. If you are serious about avoiding toiletries that contain animal derivatives, or make-up that has been tested on animals, you will have to do a little research; however the information you need is quite easy to come by. The British Union for the Abolition of Vivisection (BUAV) has a great website with a huge list of cosmetic companies that adhere to the Humane Cosmetics Standard. You can still look good and feel great about helping animals. You will also need to do some research if you want to buy domestic cleaning products that are cruelty free and animal friendly. Again the BUAV can provide information on the testing policies of various manufacturers and supermarkets. There is a whole range of cleaners available from companies who comply with their Humane Household Products Standard. Don’t forget it is also possible to make your own effective cleaning products from every day ingredients you may find around the house. It’s almost impossible to find prescribed medications that have not been tested on animals, so if you need to take medicines you should continue to do so and not try to find alternatives. But that doesn’t mean you can just accept that animal testing is ok. If you would like the pharmaceutical industry to find alternatives to animal testing you can join a campaign to put pressure on them. Write letters and sign petitions to get your voice heard. Pets of course usually eat meat in their diets. It is possible to use vegetarian or vegan alternatives, although cats need a dietary supplement if there is no meat in their diet. Bizarrely, some veterinary companies that develop special foods for pets also do animal testing. Do some research to find out which companies are approved as animal friendly and speak to your vet before making any changes to your pet’s diet. Animal products crop up everywhere; in cars, camera film, glues, asphalt, fertiliser, paint, shoe polish… the list goes on. The best you can do is learn what to look out for and try to make a conscious effort to avoid those you suspect. It all makes a difference. Animal Free: How You Can Make a Difference?